UNITED NATIONS, Mar 24 2013 (IPS) - Once dubbed “the most powerful woman in the world” by the London Times, Nafis Sadik learned at an early age that persistence leads to opportunities for change – and backlash from the Pope. “Champion of Choice”, a book by acclaimed author Cathleen Miller, details the life and times of Sadik, the extraordinary women’s advocate who served as executive director of the United Nations Population Fund (UNFPA) from 1987 to 2000. A dynamic collaboration between Miller and Sadik, “Champion of Choice” stands as an example of dedication and the power of the human spirit. The journey began 12 years ago in a quest for a story that led Miller all over the world. “The main thing that connected me to her was my tremendous respect for her,” Miller told IPS about her decision to write a book about Sadik. She emphasised the importance of spending time with Sadik’s family, the local communities with whom she had worked and the women whose stories remained poignant contributions to “Champions of Choice”. Sadik fought tirelessly for women's rights and opened a global conversation on family planning. On Mar. 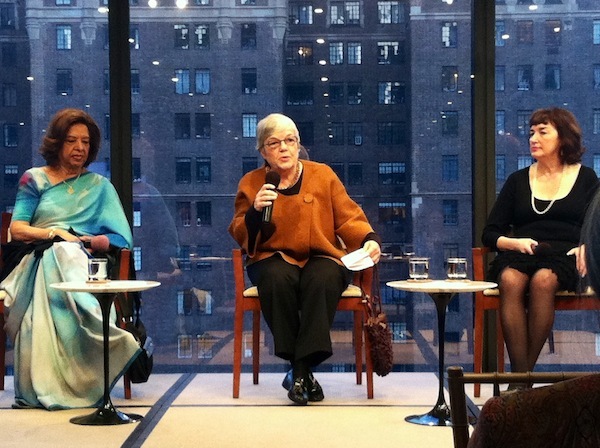 20, UNFPA, Friends of UNFPA and the International Planned Parenthood Federation (IPPF) hosted a book launch at the Ford Foundation in Manhattan to celebrate both author and subject. Sadik’s work focused heavily on the health of women and girls. She fought tirelessly for women’s rights in sexual and reproductive health and opened up a global conversation on family planning. As an undersecretary general at the United Nations, Sadik noted that her position gave her “a platform to really say what I always wanted to say about the rights of women, about sexual and reproductive health – including family planning – and how important it was and is for women to be able to exercise those rights”. Not to be outdone by her male counterparts, Sadik became well known for her outspoken views and disarming clairvoyance. Advocating for her fellow women to advance themselves within the UNFPA, Sadik changed how the organisation was set up. Advancing not only UNFPA but also the conversation surrounding global health, Sadik defied stereotypes and set out on a historic mission that fought to give women control over their bodies. In 1994, Sadik was appointed secretary general of the International Conference on Population Development (ICPD) in Cairo that brought together world leaders, non-governmental organisations (NGOs) and activists to discuss population development and human rights. She called her work there “my best achievement”, describing, “what I did was get people to the negotiating table”. Spearheading an initiative for marriage equality and the empowerment of women, Sadik believed that when a woman has the right to reproductive health and the power to decide what’s best for her and her family, population management and sustaining global development become possible. “Of course couples should make decisions together, but in the end it should be the woman who should be able to decide about her own life and about her own health and about her own needs,” Sadik said. This, however, “is not the case for the majority of women in the developing countries”. With her many contributions and the occasional controversy – the Vatican opposed Sadik’s stand on sexual and reproductive health – Sadik’s story found its own special voice through Miller. “This kind of narrative story that’s very much about storytelling – and very intimate – had the power to affect people in a different way than a book that’s historical or policy driven,” Miller told IPS. Asking tough questions and relying on Sadik to recount stories, Miller wrote from a place of learning. The outcome was an incredible account of advocacy. In a era when the world is driven by instant gratification and immediate results, Sadik remains one of the most dedicated activists for women’s health and rights, an inspiring story and legacy in her own right.